Soggy-assed, typical-Ireland-of-the-80s overcast-and-prone-to-heavy-showers late June. And Jacob has once again checked in to the Temple Street Hilton. Is it pneumonia? Is it a viral infection of the lungs? Is it a bacterial whatchamacallit? Dunno. But it’s got the little soldier digging hard for breath. As I write, his mum will be trying to bed down beside him for the night. He’s sharing a room with three other kids plus one parent apiece. Buzzers and beepers and door slams seem timed to go off – with maximum cruelty – as you are just about to nod off into a half hour of restless but damned welcome semi-sleep. 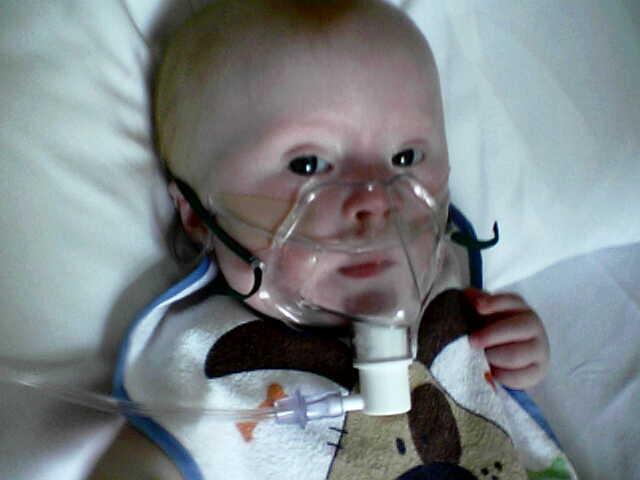 He’s been put on a nebuliser tonight and that seems to be helping. His airways look like being one of his ‘things’. You know, like a club foot or a heart condition. He didn’t get those, which is lucky for him and us, but right now them lungs are giving us all the extracurricular activity we need. The ironies heap up. 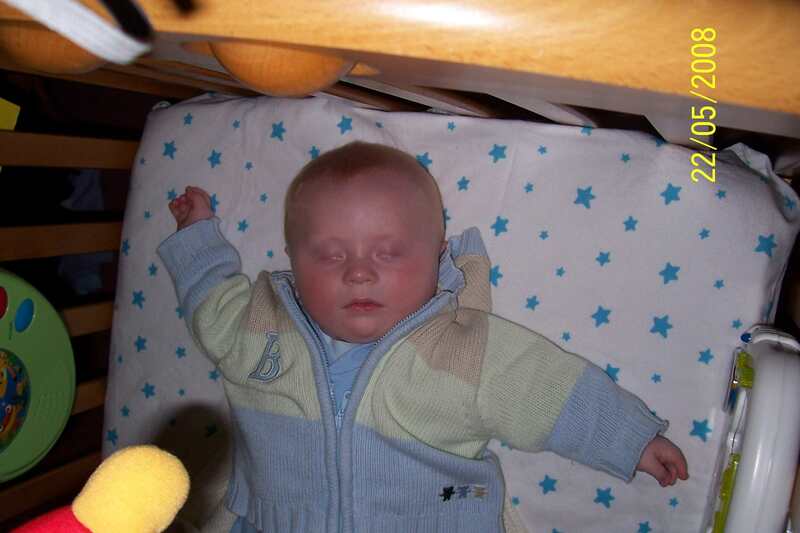 Last Christmas when Jacob was in Temple Street his grandad got a touch of pneumonia too and was in hospital himself. Where is he now, right this very second? Not five hundred metres up the road from Jacob, in the Mater Hospital, awaiting a multiple bypass. So our inter-generational double act is still keeping us in stitches! My son and my father. Are they working together, two nutty professors in white coats, planning the finer details of these krazy escapades? You know when you fill in an address form on the net and you have to select your country from the drop-down menu? Ireland is usually stuck right between Iraq and Israel. You can just feel the love, right? That’s the kind of sandwich filling I feel like right now. And maybe Jacob dodged the heart condition, but Pops is struggling tonight with three left arteries, two of which are 95% blocked while the other is really no trouble, being only 60% blocked. Yes, that’s me being ironic. You can bury your head in the sand if you want to, but it’s a guaranteed way to get your arse kicked when you least expect it. We’re at this half a year now, this having a kid with Down Syndrome thing. Those of you who know us personally will know about a lot of the adventures on the way. By adventures I don’t mean The Famous Five either. These are more of the heart-in-mouth, guts-on-spin-cycle type, the three a.m. wide-eyed, whispered two-word sentence and two-word answer. Ah yes, our heroic medical friends in Temple Street. And all the other hospitals. And our friendly local pharmacist. By now we’re virtually related, you know. And the social workers, health nurses, physiotherapists and assorted gang of benevolent do-gooders that we are pleased to know but just never expected to be making room for in our lives. You’d think that Jacob had taken over. One of the quieter disadvantages that you have to train yourself to watch out for is that you don’t neglect your earlier, ‘normal’ kids. They’ll try to tell you in their own way, of course, but if that way means acting out or throwing hissies you’re likely to have less patience than normal, because you’re a little bit frazzled now that you’ve got Down syndrome too (you know what I mean). It’s harder to spot if they become withdrawn or quiet. Easier to ignore too, what with all the special needs demanding your attention elsewhere. Withdrawn children is not something I can claim to have the remotest experience of however. But whether extro- or introvert, if you ignore the behaviour or misinterpret it, it will come back to bite. Kids demand attention. They need it. If they don’t get positive attention, they’ll settle for negative. And that too will cause aggro. As if you didn’t have enough just now. I’d love to be able to say that my house runs like clockwork, that we divide our time carefully so that everyone gets a fair portion, that all that needs to get done gets done properly, that everyone pitches in, that there is no constant cry of ‘Not fair!’ emanating from someone, that each accepts their lot and makes cheerful do with limited resources. But that’s not where we are right now. It’s something that has taken me some time to accept. Lots of things need doing, but lots of other things need doing before them. Jacob’s brothers, at six and three, are a challenge. They are demanding, selfish, ungrateful and unaware of exactly how much of their parents’ energy they consume. It took a while for that epiphany where I went ‘Oh my God they’re me! That’s what I was!’ And then the note to self: ask parents why they didn’t murder me many years ago. But that only consoles me so far, because I’m the daddy now. My remit is bigger. It’s MY energy these little (expletive) are leeching. If they had to pay $140 a barrel for it they’d wise up quick, I tell myself, because they get through a couple of supertankers each on a weekly basis. There’s no easy answer. Life isn’t a sprint. This is marathon training. I have lessons to learn because I’ve never had three boys before. The youngest one has a recognised handicap, but believe me they all have special needs. As do I. And in trying to spread my dadhood resources as wide as I need to, inevitably gaps appear. My temper gets tried too often, and I am learning how to subvert that. Why? Well because personal experience has taught me that throwing a bigger, louder hissy fit than the boys doesn’t solve anything. It just makes for a guilty dad, nervous kids and an angry wife. Take that on a picnic why dontcha! So have I got any advice? Here is all of it. Remember that your kids won’t remember how whiny they were then. Forget how whiny they are now. If you can do one thing with each of your kids individually, no matter how short a time you can devote to it, do that one thing. Quality is what is memorable. No amount of stuff you give will compensate your grown child for the minutes you didn’t give. Don’t ever think that you’re not a kid yourself anymore. Save something for you. Write a poem, grow roses, talk to a hamster, kickbox, blog, collect car tyres, sit in a darkened room and weep a little… I don’t care what it is. Make it yours and only yours. Everybody needs that space. Finally, and probably most importantly, don’t try to clean both ears with cotton buds at the same time. This, uh, this guy I know told me it doesn’t work. The young swan hid in the shallow mud and sedge, terrified. Splash splash splash splash. The strides approached her exposed refuge. It was the first, the last hiding place she could find. The splashing feet stopped, as though trying to get their bearings, then started again. She was never designed for camouflage. Her graceful neck was an arc of beauty amongst the straight reeds. Once upon a time perhaps her grey, downy feathers might have merged with the muddy straw on the bank, but now she wore a coat of purest white, impossible not to see. No other face could look like hers, at once peaceful and knowing, with a gentle tilt to the side; her beak the colour of a burnt August sunset. The footsteps were getting closer. Relentless. She had no voice to cry out, but her heart’s hammer would give her away, she felt sure. Splash splash splash. All alone. There was no sanctuary. The splashes paused. The hunter was close now. He could sense the quarry. A small satisfaction rippled through him. His equipment was the best. His method was correct. His reason was sound. He was a hunter. He would provide. A flock of curlews screamed into the air when the shot rang across the marsh. A mile away, two older swans turned slightly at the sound and moved serenely on. There was very little blood. It mingled with the muddy backwater and disappeared. The hunter turned towards home and family, satisfied with his day’s accomplishment. On June 4th a San Diego, California-based company called Sequenom announced that it had developed a test that detects Down syndrome before birth without giving false-positive results. Almost immediately the company’s share value rose 22% on the New York Stock Exchange. Sequenom intends to sell its test in the U.S. from 2009. I do not wish it happy hunting. 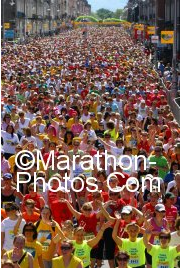 Dublin was basking in a heaven-sent shimmering blue heat last weekend as forty thousand women gathered for the annual Flora Women’s 10k mini-marathon in aid of a bagload of super charities. And our Dee was in there too! That’s her above, towards the left, the one in the t-shirt. 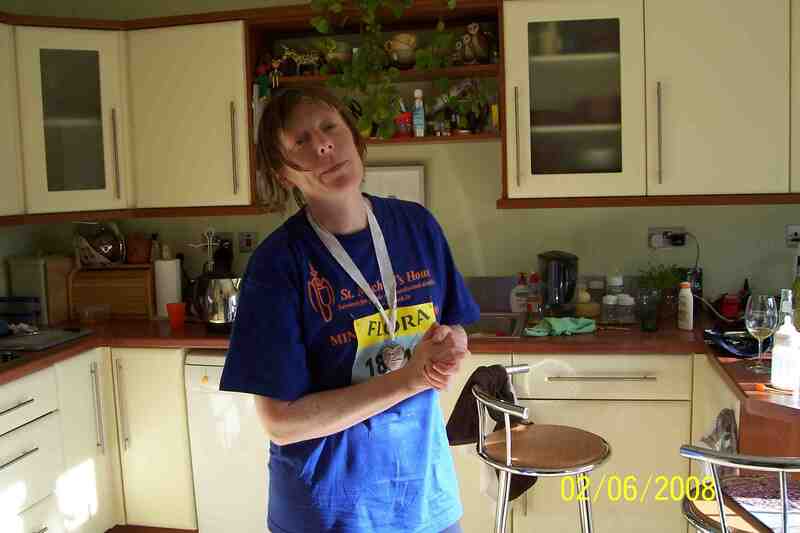 She was running for St Michael’s House, which does fantastic work for people with intellectual whatsits. She’s been hassling virtually everyone she knows for sponsorship money (and she knows me really, really well). Great news for St Michael’s House, and I suppose great news for me if we ever end up living on the street together. Otherwise a complete pain in the arse. But we’re all very proud of her anyway. She really hit the training circuit hard, putting in possibly three or four gruelling road sessions between February and May alone. And what about that heat! 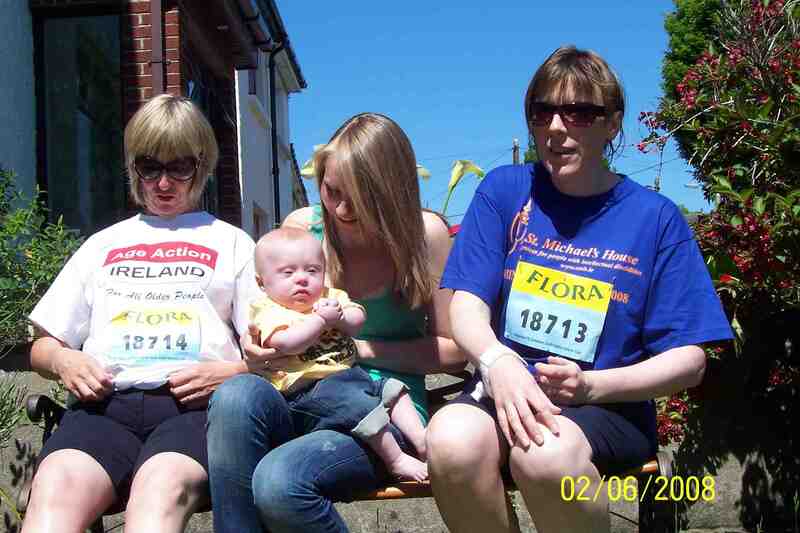 She did the run with our neighbour Helen. 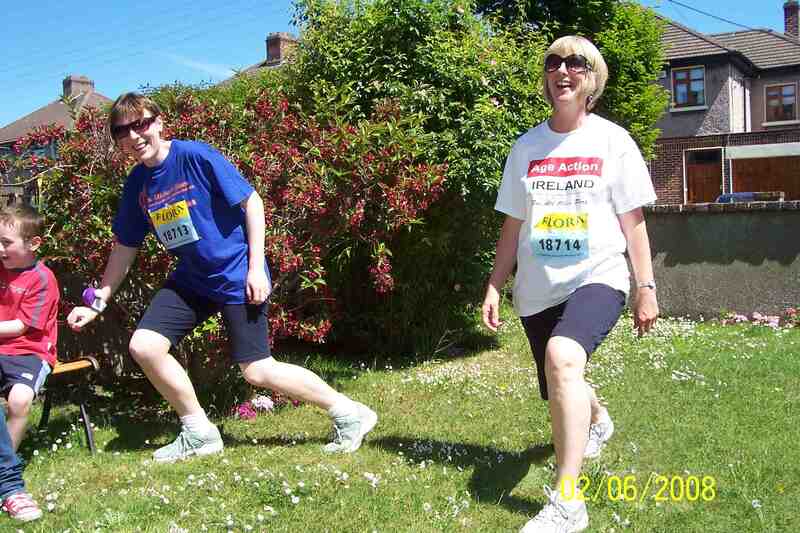 My sister Bonn did it too with her friend Leslie – well done you two as well! But it’s not just about the runners and walkers. Oh no. There’s a massive backroom team who do tireless work, you know. I tirelessly took photos in the blistering heat. Aisling, Helen’s daughter, held Jacob for the photo op. 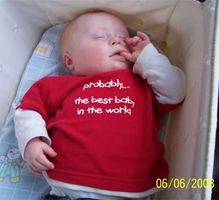 Jacob modelled a t-shirt that said ‘Am I rockin’ my extra chromosome or what!’ And I took photos. In the blistering heat. As can be seen, the fitness fanatics threw some exotic shapes before the start of proceedings. Here we see the Crouching Dragon limber-up. After the race this gets replaced by the Dragged onto Couch warm-down. Remember, forty thousand women. In one place. Many of them very serious runners. Many, many of them very serious talkers. Either way, over ten kilometers (six and a quarter miles, non-metric fans) it all requires energy, that’s all I’m saying. You end up pretty shattered, but they give you a medal, you earn squillions for charity and you get a nice, gooey, warm feeling inside. It’s just that you don’t actually have the energy left to tell your face to smile, dammit.